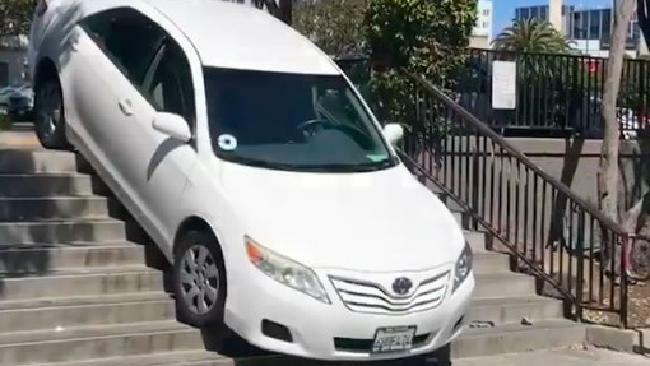 AN Uber driver in California ended up taking the stairs on Sunday after claiming the navigation system in the ride-sharing app told him to. The driver, only identified as Fred by Business Insider, was reportedly driving two passengers through San Francisco, on his way to pick up a third, when he made the wrong turn just before 1.30pm. Fred, who's reportedly been driving with the company for less than a year, told the news outlet that Uber's navigation instructed him to go down the stairs outside a pedestrian sidewalk near a Safeway supermarket. A tow truck driver attempted to remove the white Toyota Camry from the stairs around 3pm, but the cable connecting the car to the tow truck snapped, leaving the car to slide forward into a city trash can, pushing it off its bolts, the San Francisco Examiner reported. Reports indicated no one was injured in the incident, and it wasn't immediately clear whether the driver would be charged.